Well, I can finally say that I like the look of the campaign hardware as much as I had hoped. There are also more issues with the hardware than I expected (did you notice the booboo on the lower right drawer? ), but I'll get to that in a minute. First up, let's talk about where we found this undeniably beautiful cabinet hardware and the installation process. After searching high and low for recessed pulls for the kitchen drawers, I found the perfect campaign-style pulls on Etsy. They're handcrafted to by a group down in LA. Installation was tricky at best even for an experienced DIY-er (or maybe not even then...see aforementioned booboo). We had 13 pulls to put in and it took three of us a solid 6 hours. We clamped the template to the drawer face, checking that it was tight and centered, so the pulls would end up in the middle of the drawer - obviously this is super important for function and form. 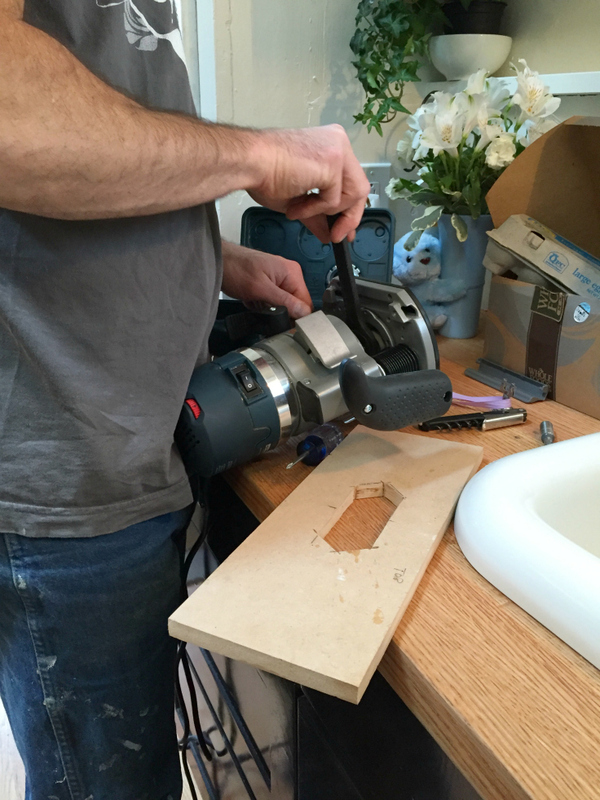 Next we drilled two holes for the screws before cutting out the recessed area with the router. Routers are messy, so we had the shop vac on hand. 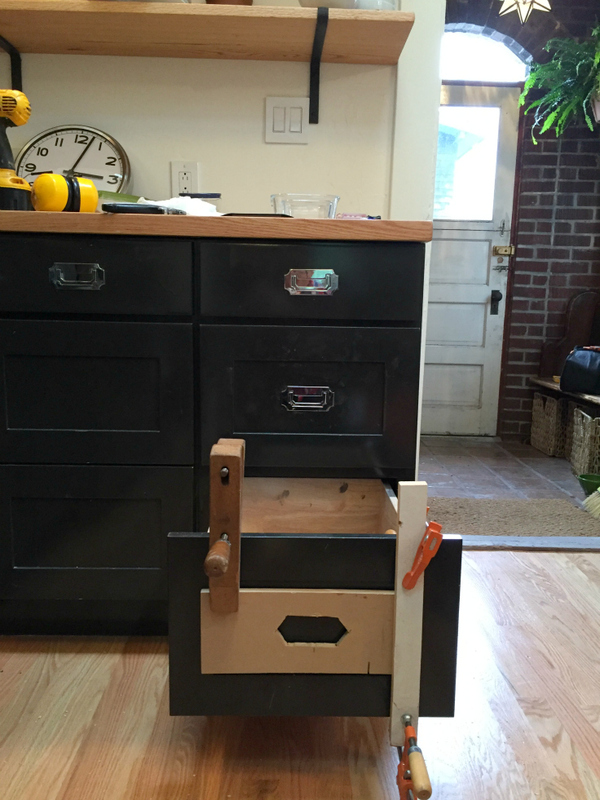 We attached the pulls with screws from the inside of the drawer and voila! Oh, but this bottom drawer. The template wasn't on securely when we began to router, so the template shifted, causing a large hole in the drawer face. We filled the hole with putty, but haven't gotten around to painting it. Super frustrating! On the flip side, the pulls are hard to use. Since the recess isn't very deep, it is difficult to grab the pull unless you have toddler-sized fingers. Really this hardware is pretty much the opposite of child-safety latches: hard for adults to use but easy for toddlers. And that is not a good thing in our home these days! My other complaints are that these cabinet pulls were expensive - like $25 apiece - and they're on the 'very difficult' side of the hardware-install scale, probably best left to a professional. So while I love them, I probably wouldn't use them again in a kitchen. Maybe on a furniture piece or some rarely-used storage but not in a heavy use area like the kitchen. What do you guys think about the look of the campaign hardware? I'd love to hear it! p.s. did you see Chip and Joanna's "barndominium" project? I dig it! p.p.s. Speaking of barns, check out this barn house. I would have lightened the interiors up a bit, but I love the concept! In fact, I've got a whole Pinterest board dedicated to barn houses, cause that's just how I roll. p.p.p.s. More "after" photos of the Dexter kitchen are coming next week! But in the meantime, I've been posting a few peaks on my Instagram page.